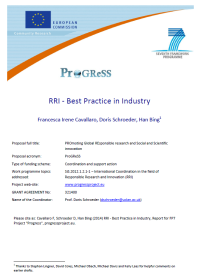 The European Coordination and Support Action ProGReSS (PROmoting Global REsponsible research and Social and Scientific innovation, www.progressproject.eu) has recently published its deliverable D4.1 entitled "RRI ‐ Best Practice in Industry". The report, written by Francesca Irene Cavallaro, Doris Schroeder and Han Bing, is about societally desirable innovations developed by industry that address Grand Challenges of humankind. Proving that ethically acceptable, sustainable and societally desirable innovation can be profitable is important to encourage more investment—reliable and transparent impact assessment procedures, standardized across all regions, are crucial. Collective action is necessary for responsible innovation to take place and all actors must take collective responsibility for research and innovation outcomes.